Opened in 1955, the course was completely redone by architects Brian Silva and Geoffrey Cornish in 1988. When it was expanded to 18 holes. The layout now measures up as one of the finest in the state. Be prepared to use every club at this extremely difficult tract, which measures 6,546 from the back tees with a rating of 73.4 and a slope of 136. The one constant is water, which comes into play on 11 holes. All golfers will be tested on the par-4 second (426), sixth (419) and 15th (414). But they can gain some shots back at the seventh (just 105 yards) and the 16th (120). The signature hole is a par-3, 180-yard 12th hole. You’re hitting over water to a kidney-shaped green with out-of-bounds long. 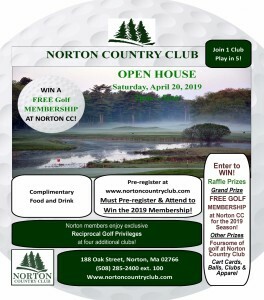 Featuring four sets of tees, Norton is relatively tight on the front nine, but as you make the turn, you suddenly find yourself in old farmland, where the fairways are treeless, but the rough is high. Fifty-eight pot bunkers dot this course, which fluctuates from tight and tree-lined to a stretch of holes that more closely resemble a Scottish-style links layout. A new pro shop was built for the 1999 season.